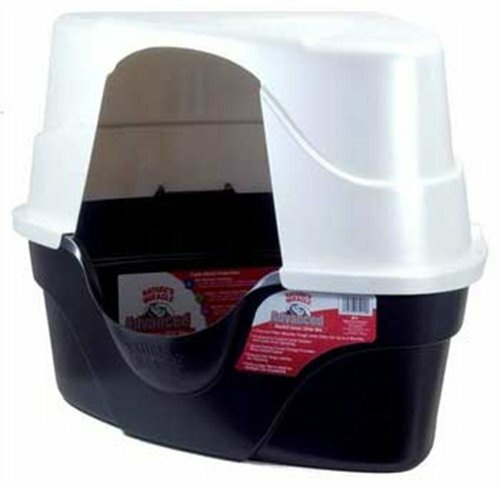 Nature's Miracle Advanced Corner Hooded Cat Litter BoxNature's Miracle Advanced Corner Hooded Cat Litter Box is made with advanced plastic technology for outstanding odor control. Odor blocking plastic material guards against the growth of odor caused by bacteria and prevents odors from being absorbed into plastic. Constructed using Ionpure(TM) antimicrobial product protection that inhibits the growth of odor-causing bacteria on surface. Additionally the non-stick surface eliminates litter caking and odor build up for easy, hassle free cleaning. The corner litter box hood features two latching side locks and an odor control charcoal filter that absorbs unwanted litter box odors for up to 3 months. The space saving corner design provides more usable space and is great for tight spaces. The large size is ideal for multiple cat households. The deep black base has flecks of gold for a sleek look that will look great in any home. The item dimensions are 26"L x 23"W x 11"H and the case dimensions are 24.2"L x 24.2"W x 21.7"H.
If you have any questions about this product by Nature's Miracle, contact us by completing and submitting the form below. If you are looking for a specif part number, please include it with your message.